This year, Andrew Scaboo has planted more acres of soybeans than he ever has at Greenley. Not only are his regular breeding program trials continuing, he has planted close to 20,000 progeny rows at the Research Center. Those rows represent more than 100 unique populations of soybeans. Scaboo will walk through each of those rows in October and the best lines enter his breeding program. 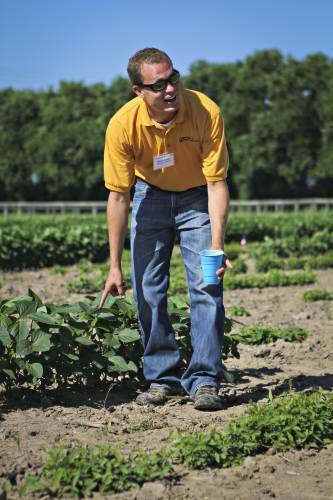 Andrew Scaboo has led the Northern Missouri Soybean Breeding Program since he joined the University of Missouri as a senior research scientist in 2012. Now an assistant research professor, Scaboo continues to dedicate his time to the breeding program, which focuses on variety development, testing and release. Scaboo conducts yield testing at six locations throughout Missouri, including the Greenley Research Center in Novelty. 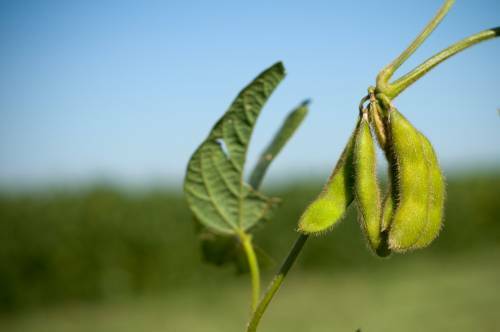 The Center has played a critical role in the soybean breeding program, which is largely funded by the Missouri Soybean Merchandising Council (MSMC). Scaboo has planted soybean field experiments at Greenley since he joined MU. The site is used for variety and germplasm development, as well as genetics research for students. Within Scaboo’s breeding program, he is evaluating a variety of important traits in collaboration … Expand ▸Within Scaboo’s breeding program, he is evaluating a variety of important traits in collaboration with several groups. Along with the USDA, Scaboo works with the United Soybean Board (USB) and the North Central Soybean Research Program (NCSRP). The USB work includes trials for high-protein soybean lines. Scaboo’s work with NCSRP is focused on yield improvement and the soybean cyst nematode (SCN) field trials. Scaboo said SCN resistance, phytophthora resistance, high oleic/low linolenic and high protein are all soybean traits evaluated at Greenley. Scaboo said soybeans in his breeding program go through four years of yield testing, with only the best lines advancing to actual variety release. The first year of yield testing includes 1,500 lines in what is called a preliminary yield trial. Those lines are being evaluated for yield, maturity and other agronomic traits. The best eight to 10 percent of those lines advance to the second year of testing, called the advanced yield trial. Those lines are not only tested at the six locations in Missouri, including Greenley, but also in Iowa, Nebraska and Illinois. The lines are condensed once again for the third year of testing, with the best eight to 10 percent advancing, leaving around 12 to 15 lines for another round of advanced yield trials. The soybeans in the third year are also put through the United States Department of Agriculture (USDA) Northern Uniform Soybean Trials and grown across the United States. The best lines are saved for the fourth year for another round of testing. They go through USDA Northern Uniform Soybean Trials again as well. In total, Scaboo receives data from 50 locations across the country. The best lines are then released. Scaboo released four varieties last year. This year, Scaboo has planted more acres of soybeans than he ever has at Greenley. Not only are his regular breeding program trials continuing, he has planted close to 20,000 progeny rows at the Research Center. Those rows represent more than 100 unique populations of soybeans. Scaboo will walk through each of those rows in October and the best lines enter his breeding program. Scaboo has planted soybean field experiments at Greenley since he joined MU. The site is used for … Expand ▸Scaboo has planted soybean field experiments at Greenley since he joined MU. The site is used for variety and germplasm development, as well as genetics research for students. Scaboo generally plants the progeny rows in Columbia. Within Scaboo’s breeding program, he is evaluating a variety of important traits in collaboration with several groups. Along with the USDA, Scaboo works with the United Soybean Board (USB) and the North Central Soybean Research Program (NCSRP). The USB work includes trials for high-protein soybean lines. Scaboo’s work with NCSRP is focused on yield improvement and the soybean cyst nematode (SCN) field trials. Scaboo said SCN resistance, phytophthora resistance, high oleic/low linolenic and high protein are all soybean traits evaluated at Greenley. “Greenley is used as a collaborative field testing site for a multitude of projects,” he said. There is a lot of graduate student work that takes place at Greenley as well. Scaboo’s students work primarily with wild soybeans.